CASE compact track loaders deliver more power with exceptional bucket breakout force and hinge pin heights up to 131.6 inches. The cab has been redesigned from the ground up to provide a larger, pressurized interior that sets the standard for operator comfort and productivity. All four models offer several choices of control and superior horsepower to give you the muscle to get any job done quickly and efficiently. One solution does not fit all. CASE carefully considered each machine's application, life expectancy, maintenance needs and operators. 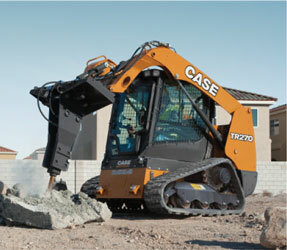 That's why every CASE compact track loader features a proven Tier 4 Final solution that is tailored for that model. The result? Compliance without compromise or complexity. CASE Tier 4-certified equipment is easier to maintain and, unlike competitive models, won't require you to master additional maintenance procedures. In fact, most CASE machines have maintenance-free emission solutions, so you can stay focused on your work—and not maintaining your machine.